After lunch at Zeppelin Hall, we walked to the Liberty Science Center. On the first weekend of the month, Bank of America customers can get into museums for free! It only covers a few museums in the area, but I’ll happily take advantage of the offer whenever I can. 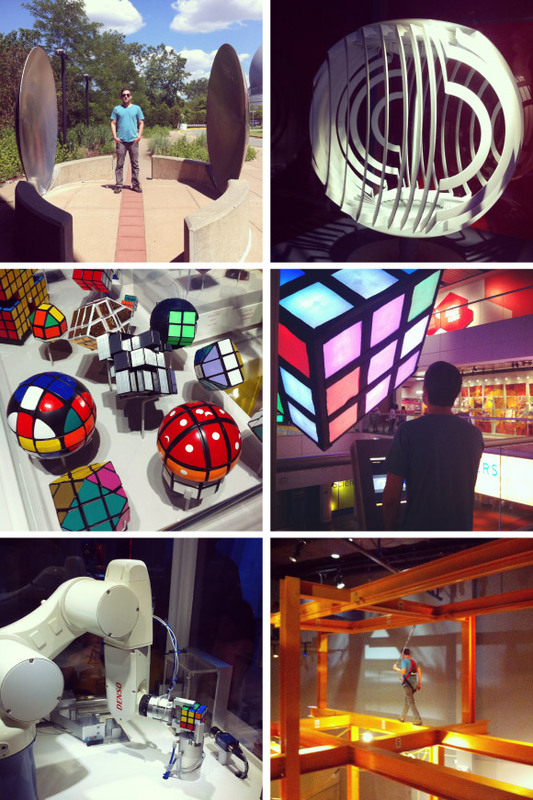 One of the highlights of our visit was the Beyond Rubik’s Cube exhibit. I’ve always been terrible at solving rubik’s cubes, but this was pretty cool. There were rubik’s cubes of all shapes and sizes, including a giant one in the atrium. There was also a robot that would solve your rubik’s cube in a matter of seconds, then do a victory dance celebrate! There was also an interesting skyscrapers exhibition. John couldn’t wait to try out the walk the steel exhibit, but it seemed too scary for me. I found it pretty exhilarating just to watch! As always, I’m not in any of our photos since I’m the one with the camera. I try to get John to take more photos, so I’m in all our photos too, but they tend to come out blurry!